Up to this point, the discussion has focused on how the Federal-aid Highway Program (FAHP) is funded and shaped, how FHWA distributes the funding to the States, how the appropriations process affects the overall program, and the promise by the Federal government to pay the States for their eligible expenses incurred during construction of a project. This chapter discusses the process through which the Federal government keeps that promise: the outlay of cash from the Highway Trust Fund (HTF) to liquidate (pay) a prior obligation of Federal funding. Four requirements must be met before the Federal government pays cash for a Federal-aid highway project. The first is that a State or other eligible recipient must submit to FHWA a voucher associated with a valid obligation of Federal-aid highway funding. This process is described in additional detail below (under “Payments to States”). The second is that the HTF must have enough cash to cover the amount of the voucher. The third and fourth requirements—expenditure authority and available liquidating cash—are described below. Expenditure authority. The Trust Fund must have expenditure authority: the general legal authority, subject to an appropriations act, for the HTF to expend cash that it has on hand in order to meet an obligation that had been made pursuant to a surface transportation authorization act. Congress provides expenditure authority in an authorization act. This authority normally covers the period of the authorization act and ends on a date specified in the act; as an example, the FAST Act extended the authority to expend funds through September 30, 2020. Appropriation of liquidating cash. In addition to general expenditure authority authorized for the HTF, FHWA must have the legal authority to outlay a specific amount of that cash. This amount-specific authority is called a liquidating cash appropriation. As described in Chapter 4, each year FHWA requests liquidating cash in the President’s Budget request. Congress appropriates liquidating cash within the annual appropriations act, and then FHWA uses that authority to pay States. Any liquidating cash appropriated by Congress but not paid out by the Trust Fund during the year can be carried over for use in the next fiscal year. Conversely, if Congress finds that it appropriated insufficient liquidating cash in the annual DOT Appropriations Act to pay the Trust Fund’s bills, it may enact additional legislation to provide additional liquidating cash. Under the FAHP, FHWA does not distribute cash in advance to States. Instead, it notifies each State of the balances of Federal funds available for its use, meaning that the State may request obligations, begin projects, and then later be paid for eligible costs incurred. The project need not be completed, however, before a State begins to receive payments. Depending upon the type of the project, the time elapsing from obligation to outlay (payment) can vary from a few days to several years; see “outlay rates” below for additional detail. Payments are normally made to States. However, if a project is initiated on a toll facility under the jurisdiction of a public authority in a State, payments can be made directly to that public authority if requested by the State transportation department. A contractor does work on the project. The contractor sends a bill to the State, which processes the bills for all work done throughout the State. At this point, the State has incurred the cost. The State sends FHWA electronic vouchers to review and approve for payment. The FHWA certifying officer certifies the State transportation department’s claim for payment. FHWA submits these certifications to the Treasury Department. The Treasury Department transfers the Federal share of the cost for all projects on the vouchers directly to the State’s bank account by electronic funds transfer. As figure 6 illustrates, this sequence repeats, often beginning again before the first round is complete. The process is routine, and it is possible that steps three through six may occur on the same day. This general framework—obligation of funding, progression (or completion) of work, and only then outlay of cash—has led many to refer to the FAHP as a “reimbursable” program. 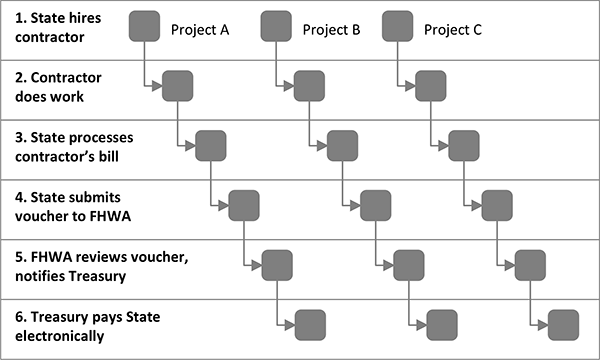 In many States the program operates in this manner: the State, as the contracting agency pays the contractors’ invoices, submits the necessary vouchers to FHWA, and uses the Federal cash to reimburse itself. However, there is no legal requirement for a State to front the bill payment with State revenues; at its discretion, a State may instead use the Federal cash to pay the contractor’s Federal share of the bill. The timing of the Federal payment to the State is governed by an agreement between the State and the Treasury Department in accordance with the Cash Management Improvement Act of 1990. FHWA’s payments are generally deposited in the State’s account on the same day payments to the contractor are made. The rate of outlay from the HTF varies from year-to-year. As a surface transportation project may take years to complete, outlays from the HTF for projects may similarly extend over a multi-year period. Figure 7 shows the number of years that pass, on average, between the obligation and outlay of Federal-aid highway funding.